Federal Reserve monetary policy has a profound effect on the U.S. economy and consequently on investments. 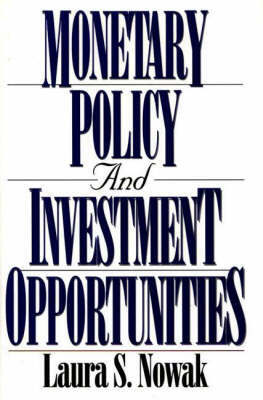 This unique book combines the institutional approach to monetary policy with the theories and principles involved in applying that knowledge to investing. Although there are many books on the Federal Reserve and a myriad of books on investing, this synthesis of institutional, theoretical, and practical applications is unique to the marketplace. In part I, Laura Nowak reviews the political origins of the Federal Reserve and follows its growth into the powerful arbiter of U.S. economic policy today. The actual conduct and effects of monetary policy are then explained with an eye toward identifying changes in policy that can be applied to the investment world. In part II, the effects of monetary policies on stock and bond markets and on particular industires are discussed, followed by a description of the investment instruments that will be impacted by different policies. In conclusion, Nowak offers a chapter of suggestions for hedging against changes in monetary policy and another chapter describing the tools that can be used for this purpose. The book will be useful to investment professionals who are intimately involved in their own specialty but who want and need to understand how the system works so they can improve their performance and advise their clients with more knowledge and authority.